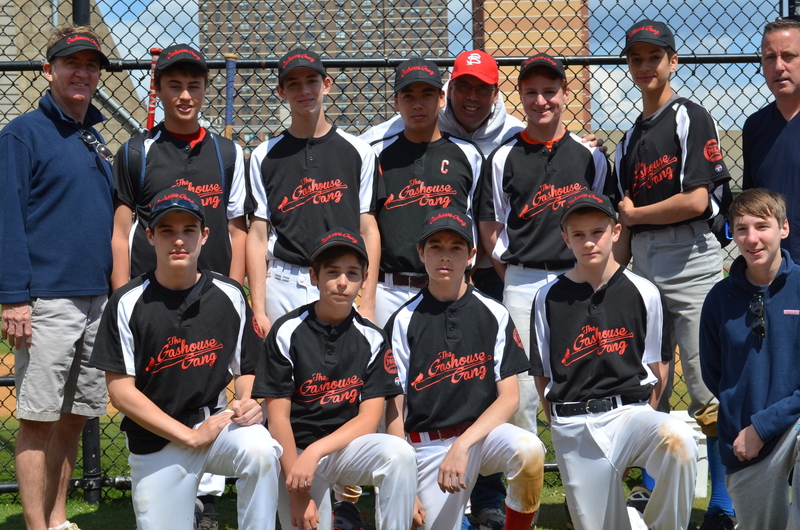 Earlier this spring, the Peter Stuyvesant Little League debuted a new division for disabled players, The Challengers. The kids were recruited pretty quickly, with just enough time for them to be able to march in the league’s annual parade on April 1. Then, last Sunday, the newly formed division played its first game on Con Ed Field. For many of the 25 players, who’ve been placed on two teams, the Angels and the Braves, it was also their first time playing baseball. 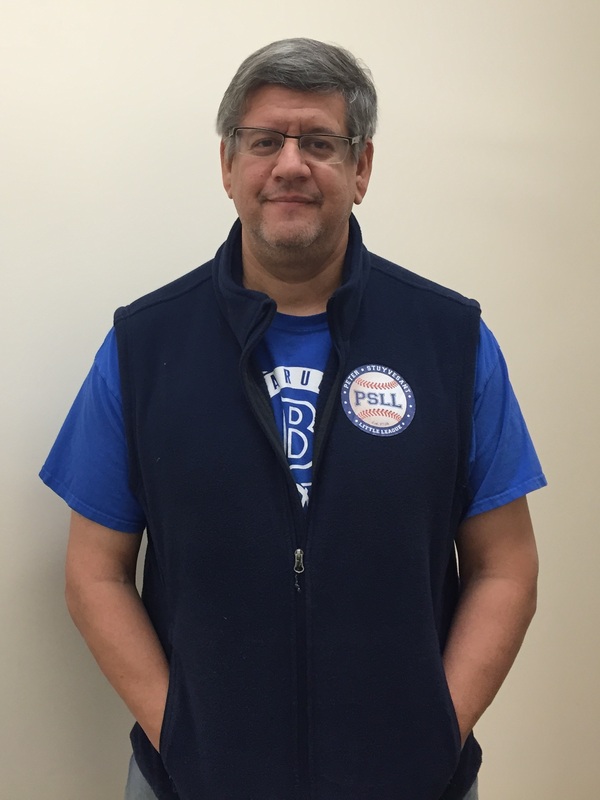 Rick Hayduk, Stuyvesant Town’s general manager who helped form the division, said because of the severity of the kids’ disabilities, they wouldn’t have been able to qualify even to play tee-ball (which is how most Little Leaguers start). The players’ conditions include varying degrees of autism, cerebral palsy and Down Syndrome. When Peter Cooper resident Zach Elder declared at age 9 that he wanted to learn to snowboard, his parents were shocked. Elder is autistic and his mother Karen said that up to that point, her son was not very verbal, “never saying anymore than he needed to say to get the point across,” she said. But Elder was determined to snowboard, and that willpower to learn the sport paid off: he’s now 20 and on January 28, won a silver medal at the X Games in Aspen in the Special Olympics Unified Sports snowboarding event. Elder, who has been competing in races since age 13 and who said his idol, Olympic and X Games gold medalist Shaun White, inspired him to learn the sport, is a member of a team with the Adaptive Sports Foundation, a non-profit organization offering outdoor physical activities and education for individuals with physical and cognitive disabilities and chronic illnesses. Although Elder trains at ASF, which is about an hour south of Albany, he has deep roots in Peter Cooper Village. His father, Richard, grew up in Peter Cooper and went to Stuyvesant High School when it was still in the neighborhood. “My mom is 91 and still lives there,” he said. Author Brenden Crowe is pictured shooting the puck. The player wearing the #21 jersey is Robbie McDonald. John Mastrorocco is the goalie. The boy closest to #21 is Phillip Spallino. Player #19 is Danny O’Shea. Other kids pictured are: Neil Crawford, Ricky Kirk, Eddie Mackey and Pat Mackey. The greatest place to grow up in the sixties and seventies was Stuy Town. You had hundreds of kids playing in Stuy Town’s 12 playgrounds, not realizing that these friendships they were forming were not for a few years but for life. There was an unexplainable bond that Stuy Town kids had for each other. If you grew up on the same playground the bond was even stronger. If you lived in the same building, it was like you were family. When I was in second grade, I used to take Jimmy Delaney (first grader) to school at Saint Emeric’s. You were just taught to look after one another. When you went south of 14th Street in those days you had to be careful because it was a tough neighborhood. Charlie White of 271 Avenue C actually got shot in the leg going to Saint Emeric’s. A couple of Stuy Town kids got robbed going to school. My father always taught me to see trouble a block ahead so you can make a left or a right hand turn. My brothers and the older kids taught us to be tough. When you walked to Saint Emeric’s you had to pass by Strauss Auto Parts store at 14th Street and Avenue C. There was no one ever in that store but somehow they made a living because it was there for over 40 years. Another establishment you would pass was Mousey’s bar on 13th Street and Avenue C. If you look in the dictionary for the word “dive,” you would see a picture of Mousey’s. They should have had a sign in the window, “underage drinking encouraged.” After you passed Mousey’s, you went east on 13th Street toward Avenue D and you had Haven Plaza on your right and Con Ed on the left. The Con Ed men would try to make us laugh and always gave us electric tape for our hockey pads if we asked. It was always comforting knowing they were there. When you got close to Avenue D, you made a right into an alley way. Once you made it past the alley way you knew you were safe and now it was time to have fun in the playground. There were many games we used to play but my favorites were ring-a-levio and punch ball. The Saint Emeric’s playground was probably four times bigger than the average Catholic school playground so there was plenty of space to play. Ring-a-levio was usually played with seven or eight kids on each side. One side would start behind a safety line and each kid’s goal was to touch the Church wall which was about 100 feet away. Each kid would go off on his own and try to touch the church wall with about seven or eight kids trying to grab you. And kids didn’t grab you softly. The last two kids were usually the best athletes who got to run towards the wall together. They were known as the Big Two. If you were a member of the Big Two, you were moving up in the world. If one of the Big Two touched the wall he freed all the kids. You had to get back to base without being captured. If you were captured again it was really sad. The other game was punch ball. All you needed was a rubber ball and chalk for the bases. It was played like regular baseball. The batter would throw the ball up in the air and punch the ball as hard as he could. Playground 5 was the place to play punch ball. It was a rectangle playground being 200 feet long and 75 feet wide. The game was seven on seven (no pitcher or right fielder). If you wanted to hit a home run you had to hit it to dead center and it had to go between the “three trees.” You would see unbelievable one handed catches because you didn’t have a glove. Kids would slide on the concrete like it was nothing. I remember my brother Brian, Sid and Mike Lyden being able to reach the “three trees.” Other players like Frannie Sheehan, Pat Cavanaugh, and Kevin Keane seemingly could punch the ball just wherever they wanted. If you found yourself playing catcher or second base in punch ball you knew you were close to not being picked next time because they were positions that didn’t get much action. One time my brother Timmy was playing punch ball with the older guys. It was the bottom of the last inning and a boy on third with two outs. Ronnie Driscoll, an older boy, came up to Timmy and said, “Timmy, I really want to win this game.” Timmy got a hit to win the game and Ronnie picked up Timmy on his shoulders. Years later Ronnie told Timmy he had a bet on the game. One time Mike Cavanaugh hit a home run hitting a ball on top of Saint Emeric’s roof. When I think of Mike Cavanaugh I don’t think of him as a successful engineer but the boy who was the only one to hit a home run on the roof of Saint Emeric’s. When I think of Billy “Nat” Foley, I don’t think of him as a successful Wall Street executive, but the boy who made some amazing shots at Playground 9. When I think of Jim Nestor “Wolfe,” I don’t think of him as a successful writer but the clutchiest pitcher in the Knights of Columbus softball league. When I think of Eddie Mackey, a successful CPA, I think of Eddie Mackey, a successful CPA. The Mackey family has been a great family in Stuy Town for over 60 years. At Saint Emeric’s, there were hardly any problems between the Irish and Italian kids from Stuy Town and the Puerto Rican kids from below 14th Street, some of whom lived in the projects across the street. The parents also got along famously and it definitely showed at Midnight Mass on Christmas when half the mass was in English and the other half in Spanish. There was great camaraderie. The only time there was tension was when one of the teachers in my brother Timmy’s class decided it was a good idea to put a production of “West Side Story” on with the white kids as the Jets and the Puerto Ricans as the Sharks. When I was in third grade, I got invited to a party for Carlos Lopez in Jacob Riis housing project. I always heard how dangerous it was. If I had to go there by myself I probably would have been scared, but my mother took me to the party. It seemed to be an unwritten rule that if you were with your mother no one could bother you so I felt safe. Everyone had a great time at the party. Stuy Town kids were good kids but no one I knew was an angel. Our third grade class got invited to the Bozo the Clown T.V. show. It was exciting and fun to be on a set. Roseann Keane was chosen to try and win prizes. She had to spin a Frisbee on a stick. I thought Roseann spun the Frisbee on a stick for a period of time. Bozo disagreed. Our mothers were best friends and I figured I would have gotten all the boy toys. When the camera started to span the students I didn’t make the best decision in my life when I gave the finger to the camera. A week later Bozo was going to be shown on T.V. My strategy was to sit in front of the T.V. and when they showed me flipping the bird to Bozo I would stand up and block my mother’s view. It worked. When I went to school the next day I was treated like a hero with lots of pats on the back. I still was worried about being called down to the principal’s office. I somehow got away with it. Right below 14th Street, there was a gang called the Black Spades. They always wore their gang leather jackets. An off-shoot of this gang was called the Young Spades, who also wore gang leather jackets. They were young teenagers. One time the Young Spades were walking from Playground 4 to Playground 5 when Neil Crawford, John Mastrorocco and I threw dirt bombs at the gang. They immediately chased us. We ran through Playground 11 and when I got to the other side of the playground, I got my pass key out and ran into 14 Stuyvesant Oval. Every Stuy Town kid had a pass key for all 89 buildings. We got away. Somehow the Young Spades found out John’s name. I saw Mrs. Mastrorocco the next day and she said, “If they know John’s name I think they should know your name too.” I remember thinking that that was the worst idea I ever heard of. Most Stuy Town kids stayed on their playground or the one closest to them until they were 11 or 12 and then they branched out. Whatever playground you lived on was the sport you played. 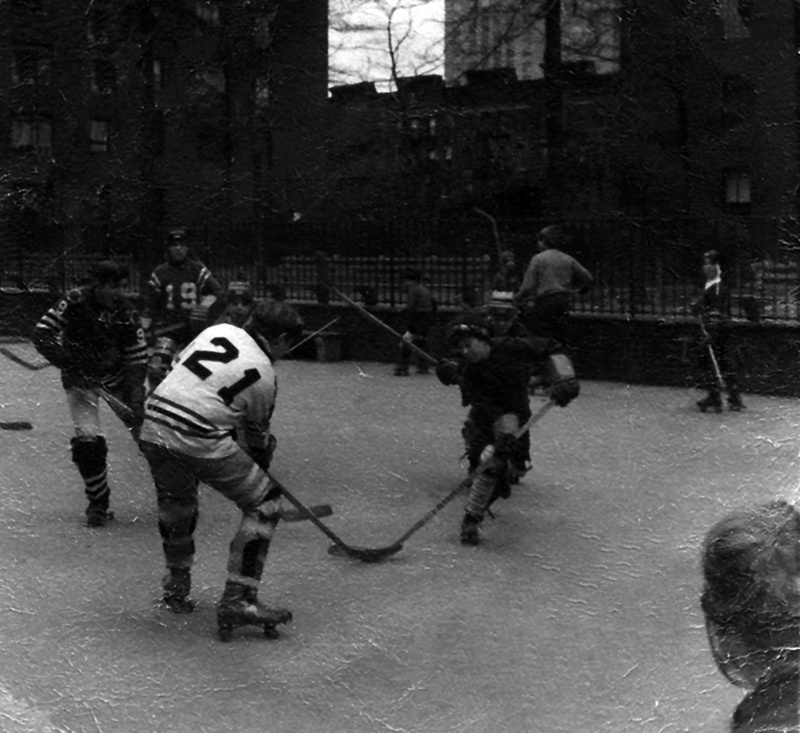 Playground 7 was the mecca of Stuy Town hockey even though Playground 5 and Playground 1 also played hockey. We had a hockey league at Playground 7. Playgrounds 9 and 11 were basketball playgrounds. Our Playground was Playground 5 where we played football, hockey and punch ball. My brother Timmy and his friends Mike Cavanaugh, Danny O’Shea, Rickey McDonnell, Marc Smalley and Robbie McDonald, just to name a few challenged the Playground 11 boys — Billy Jaris, Paul Gannon, Billy Kiernan, Jake McGarty and Jimmy Murtha to a game of football. This was definitely a Playground 5 sport. It was always exciting to play kids from another playground in any sport. I was proud of the Playground 5 boys, winning the football game 5-1, with my brother Timmy catching two touchdowns. When the Playground 11 boys challenged Playground 5 in basketball, they crushed the Playground 5 boys. Stuy Town had the greatest athletes because we played sports all the time. There were no emails, phones, computers or Instagram. We played hard and played all day long. Kelly Grant played professional basketball in Europe. Donny Jackson was the quarterback at Columbia. Kevin McQuaid set football receiving records at Fordham. John Owens had the Catholic school track record for the 100-yard dash. Mike Lyden and Richie Maier were stars playing hockey in college. In one game Mike Lyden scored a hat trick and my brother Brian and his friends threw their hats on the ice. Roger McTiernan was the M.V.P. in the Xavier-Fordham football game; 35 years later Roger’s son also won the M.V.P. The boys weren’t the only great athletes in Stuy Town. Nancy Murphy was three years older than me and I would watch in awe how well she competed against the boys. Nancy was the prettiest tomboy and was excellent in football, basketball and punch ball. Gina Ribaudo along with Rosemary Bennett and Dianne D’Imperio led the Epiphany eighth grade girls in basketball to the Manhattan Catholic school championship. Gina, in a foul shooting completion at the Police Academy, was 15 for 15. If we weren’t playing sports we were finding fun things to do. I remember my brother John and his friends jumping off the garage ventilators which were about 15 feet high and jumping into the snow drifts. I remember scores of kids sleigh riding on Playground 5 hill and sleighing underneath a two-foot chain. God must have been watching after us because no one broke his neck. Once in a while my father or another parent would take us up to Pilgrim’s Hill in Central Park and go sleigh riding on some big hills. We played a game called “Animal,” where one kid had the football and all the other kids tried to tackle him. We had snowball fights, went skitching, played scullies and played tackle football in the snow in the playground. We had great games of manhunt. One kid at Playground 7 took the long fire hose out of the staircase and turned the water on in the winter full blast. Instead of playing roller hockey the next day, kids brought out their ice skates. Kids from Immaculate Conception and Epiphany would have water balloon fights. Once, kids from Immaculate chased Padraic Carlin, Brian Loesch and me with eggs, shaving cream and water balloons. Unfortunately Brian didn’t make it. Mrs. Loesch had to do an extra load of wash that night. One time I was going home and I heard two people screaming my name from the roof. It was Jimmy Murtha and Jeanie Collin who locked themselves on the roof. I went up to unlock the door. The roof was one place that Stuy Town kids found love. I’m proud telling people I grew up in Stuy Town. We had so many characters but even better guys and girls. We were raised by parents from the greatest generation who all seemed to think alike. Kids moving away from Stuy Town was extremely rare. There was such stability. There was no keeping up with the Joneses because we all lived in the same complex. I wouldn’t trade my growing up in Stuy Town for anything in the world. 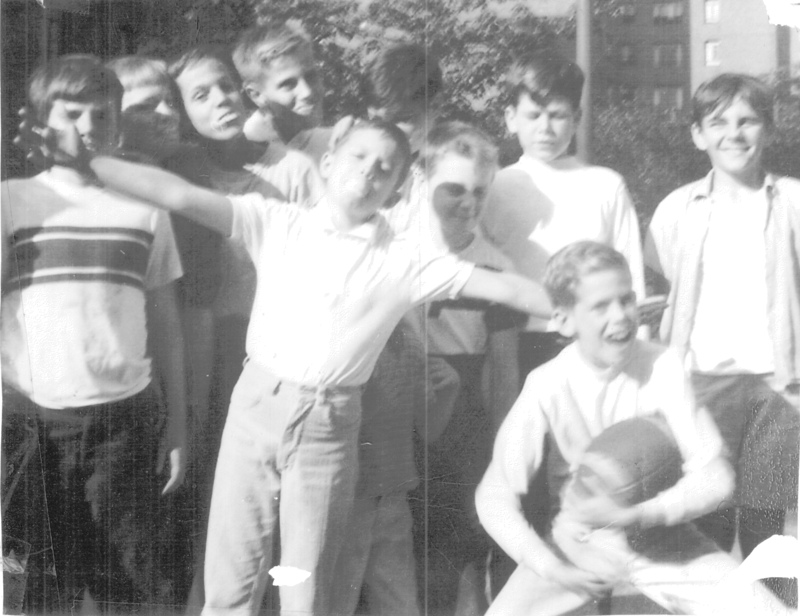 The kids of Stuy Town are now in their 50s and 60s but many are still called by their nicknames. People still call my brother Brian Birdie. People still ask D.A. Hopper what D.A. stands for. Donald Hopper would tell them it means, “Don’t ask.” The kids of the 60s and 70s do get together periodically. Bubba Kiely has had his turkey trot party for over 40 years. Stuy Town guys go to the racetrack at Monmouth once a year and always have a great time. My brother Timmy, among others, have golf outings to keep in touch. Unfortunately we also see each other at wakes and funerals. One of Stuy Town’s best passed away last month. His name is Jimmy Capuano. He was a great athlete, played guitar, was tough and loved to laugh. He was a great father and husband. You know how much he was loved because you were waiting on line at Andrett’s Funeral Home for over an hour. I would make a winning bet that Jimmy is playing guitar right now for the choirs of angels. God bless Jimmy, his family, and the people who grew up in the playgrounds of Stuy Town in the 60s and 70s. Although the team did not recognize why at first, the 2014 Juniors Team was something special from the get-go, according to team manager Tim McCann. After the regular season the GHG was seeded #3 with a record of 6-3-1 in a league comprised of nine teams from the combined leagues from Greenwich Village, Downtown Manhattan, East Harlem and the East Side of Manhattan (PSLL). All players aged 13-14 were eligible to play and represent their respective leagues and compete for the coveted trophy for the title of best Juniors team in Manhattan. The Gashouse Gang title run started against the Eagles, seeded #2 and last years title winners from the Greenwich Village League (GVLL). Jackson Rocke was the GHG starting pitcher and faced the difficult task of quieting the Eagles potent offensive lineup. “The Championship had to go through the GVLL league and Jackson was more than up to the task pitching us to an 8-5 win,” said McCann. 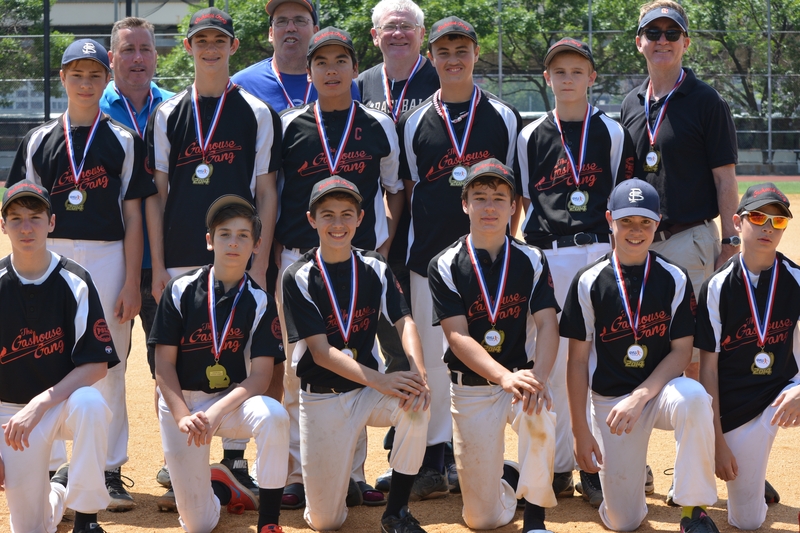 Next up was the PSLL’s very own Lightning team who finished with a league leading record of 11-2 record and seeded #1. ‘The good news was a PSLL team was going to the Juniors king of Manhattan; the bad news is it could only be one team, McCann added. Andrew Mattiello was the GHG starting pitcher and needed to pitch a near perfect game if the GHG was going to win the championship. Mattiello nearly did allowing only two hits as the Gashouse Gang cruised to a 5-2 win in a pressure-packed game in front of friends and family at Bertraum Field located under the Manhattan bridge. Town & Village newspaper has been providing news for Stuyvesant Town and Peter Cooper Village for over 65 years and we’ve decided to start taking a look back to see what was going on in the community 50 years ago. Here are a couple of snapshots from the June 18, 1964 issue of Town & Village. Dogs weren’t allowed in the complex in 1964 and as a result, a Stuyvesant Town family found themselves in a court battle with property owner Metropolitan Life over their pooch. A cover story in the June 18 issue said that the dog was a 15-pound French poodle and had been living at 16 Stuyvesant Oval with the family for the past eight months. The story noted that it wasn’t Met Life’s intention to evict the tenants but to evict the dog, and it went on to say that the pooch’s owner, a lawyer by the name of Murray Leonard, intended to represent her in court. The owner based his case on recent court decisions that held in similar circumstances that residents could house a dog if it could be proven that the canine was not a nuisance to others. The Leonards had been living in Stuyvesant Town since 1948 and Leonard’s wife said that the dog was a gift and it was not their intention to purposely violate their lease. A police blotter item in this 1964 issue of the paper noted that a Peter Cooper Village resident was found guilty of inciting a riot in connection with a civil rights demonstration the previous July. The story said that PCV resident Anthony Wells, 23, who was an alleged member of the neo-Nazi National Resistance Party, was one of eight men accused of seeking to incite violence against black people who were demonstrating at a White Castle diner in the Bronx. Police found a cross-bow, guns and knives in the alleged Nazi’s station wagon. Members of the Peter Cooper-Stuyvesant Little League team, the First Federal Savings & Loan Indians, gathered at home plate after beating the Village & Towne Sweet Shoppe Cubs and being named the World Series champions in a close game the previous Saturday. Whenever one of the Peter Stuyvesant Little League teams is asked to choose a name the usual inclination is to immediately choose Yankees or Mets before another team has a chance. This year one of the juniors teams wanted something different. With most of the players born and raised in Peter Cooper Village and Stuyvesant Town and with their little league years coming to a close, it was decided they wanted a name which would pay homage to their place of origin. Stuyvesant Town/Peter Cooper Village was long known as the Gas House District as early as 1842. After the first gas tank was constructed, huge gas holding tanks soon followed and unfortunately occasionally leaked, making the area an undesirable place to live. To make matters worse, crime was high and it also just happened to be the home base of the Gashouse Gang, which committed a reported 30 holdups every night on East 20th Street alone around the turn of the century. “I’m not quite sure if the team was aware of the notoriety of Gashouse Gang and the gang’s history but either way, the team is aptly named,” said McCann.